Should You Tip Blackjack Dealers? When playing blackjack in a traditional casino as opposed to online, you might see some players give their dealers tips. Several players find tipping to be necessary, while others find that any losses that they have would be enough money lost for entertainment. One huge difference between online blackjack and traditional blackjack would be this tipping factor. A great advantage that comes with online blackjack would be the lack therefore. Conversely, playing casino blackjack doesn't mean tipping is required. However, it is somehow expected of a player. After all, many fellow players might give you grief if tips aren't given out and the bad vibes start to flow in. One great thing to remember, while dealers deal, is that they are getting paid on minimum wage just to deal your cards. This is because the actual casino assumes that players will tip the dealers, not because dealers are only worth that little. See, if a dealer makes more per hour - tips included - the casino will feel like they have to pay the dealer's superiors a lot more, as well, in order to ensure that they still make more than the dealers. The problem with this is that the casino will not be able to find anybody to supervise with pay cuts if blackjack dealers make more money. 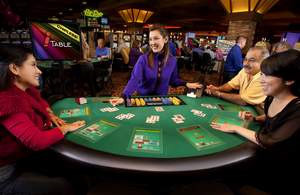 It happens to be vital for casinos to have supervisors for their blackjack dealers, though, in order to keep the game's integrity intact and to hand out free dinners, hotel rooms, buffets, parking validation and other things as comps, so players come back again after playing. Tipping blackjack dealers would also be great for karma. This should be taken into consideration, even if you don't believe in karma. Think about it: what if the dealer can influence the decision of fixing problems during the game or discrepancies of any kind? What if those decisions could affect your overall bankroll? These would be the times wherein you should treat the dealer well in order to make positive differences in your life.